Bed bugs can be an awful and distressing problem. Signs that you have a bed bug problem may be hard to see initially. Many times these pests are confused with other annoying insects. You can determine whether you have a bed bug issue in your home by considering the following signs and symptoms. Bed bugs leave small clusters or lines of red, flat marks on the skin. If you or your loved ones experience these types of bites, you may have a bed bug problem. While these bites do not spread disease, they can cause irritation and become infected. As their name suggests, bed bugs are typically found in beds. These insects are generally active at night when people are sleeping. They are more apt to feed on exposed skin on the upper areas of your body. 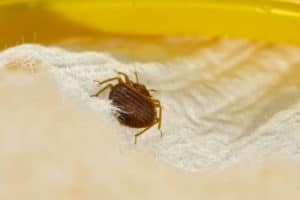 If you find you are waking in the morning to red, itchy welts on your neck and shoulders, you probably have a bed bug problem and need home pest control services. One of the first signs that you have a problem with bed bugs is,�of course, bugs in your bed. After feeding on people, these pests leave small rust-colored blood spots on the linens. Look for these types of stains near the edges and corners of your beds. Bed bugs also molt and you may find layers of their skin in your bed. If you notice a strong �wet towel� odor in our room, you may have a bed bug problem. These insects emit pheromones that can be quite foul when there are large numbers of them in your space. A clean room should not smell bad. Tidy your bedroom and check for bed bugs. If the smell lingers, you will need the help of a home pest control services professional. Keep in mind that bed bugs will snuggle into any space where you sleep, whether that�s at home or in a hotel. You can reduce the chances of experiencing these problems by doing some inspections before you settle down to sleep. Take the linens off of the mattress and box spring and carefully check the seams and corners of the bed and sheets. It�s a good idea to use a flashlight and magnifying glass to look for rust spots, molting skin or the actual bugs. If you are staying in a hotel, check anything in your room that has upholstery. Again, use a flashlight and magnifying glass to inspect the bed, curtains, couches, chairs and even the carpet. Make sure to check the closet as well. Don�t put any of your own clothing into a closet or drawer before making sure the area is free of any pests. If you think you have signs of a bed bug infestation, be sure to get the help of a home pest control services professional in Frisco, TX. Contact the experts at Safe Pro Pest to get the job done right. Call (972) 435-0700 today!